2.1.1. 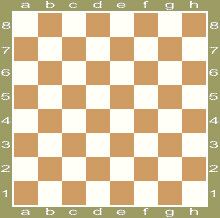 Draughts-64 are played on a square board, divided into 64 equal squares, alternately black and white. This board is a draughts board. 2.1.2. The game is played on the dark squares of the board. Thus, 32 squares are active. 2.1.3. The skewed lines formed by the dark squares are the diagonals. The longest diagonal, which joins two corners of the board and comprises 8 squares, is called the long diagonal. 2.1.4. The board has to be placed between the two players in such a way that the long diagonal starts at the left hand side of each player. This way, the first square at the left hand for each player is a dark square. 2.1.5.4. Columns: vertical lines with 4 dark squares. 2.2. 1. Draughts-64 is played with 12 white or light colored men, and 12 black or dark colored men. 2.2.2. At the start of the game, the 12 white men are put on the dark squares of the 1, 2, 3 horizontal rows and the 12 black men are put on the dark squares of the 6, 7, 8 horizontal rows (Diagram 2). Horizontal rows 4, 5 are free. 3.2. A man and a king have different ways of moving and capturing. The movement of one piece, either a man or a king, is called a “move”. 3.4. Each move must be done with only one hand. 3.5. A man has to move, forwards over a diagonal, towards an empty square of the next row. 3.6: A king is a man, which reaches and stops at one of the squares of the last line nearest to his adversary, and is crowned with a man of the same colour. 3.7 : When a player reaches the last eighth (counting from himself) line both players may crown the man which stops at the last eighth (counting from himself) line. However if the opponent does not do this it is the obligation of the player to crown his man as part of his move. Not crowning a man promoted to King is considered an irregular move. In cases stipulated by the regulations of competitions, a king may be denoted by an inversion of man. 3.8. A king moves forwards and backwards over the successive free squares of the diagonal he occupies; thus he can come to rest, passing over free squares, on a distant free square. 3.9. The move of a piece is finished when the player has released the piece after moving it. 3.10. Whenever a player, who has the move, touches one of his playable pieces, he has to play with that piece, provided a legal move is possible. 3.11. As long as a piece during a move has not been released, the player can put it on another free square, if that is possible. 3.13. It is considered incorrect, when a player who does not have the move, touches or adjusts one or more of his men or of his opponent. 4.1. Capturing a piece of the opponent can be done both forwards and backwards. A capture counts as one complete move. One cannot capture one’s own pieces. 4.2. Whenever a man meets, diagonally, a piece of the opponent behind which is a free square, he is obliged to jump over the opponent’s piece and occupy that free square. That particular piece of the opponent is taken from the board. This total operation is the capture by a man. 4.4. A capture has to be clearly indicated and executed in this order. Absence of a clear indication is incorrect, and rectification can be requested by the opponent. The capture is considered finished when all the opponent’s captured pieces have been lifted from the board. 4.7. In the course of a multiple capture, it is forbidden to jump over one’s own pieces. 4.11. 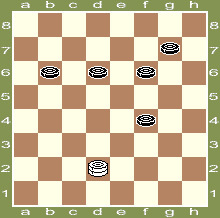 The opponent’s pieces can only be lifted from the board after the completion of the multiple capture. The pieces are taken from the board after the move itself, and in the ascending or descending order of the capture, without stops in between. Taking the pieces in another order or without order is considered incorrect and rectification can be requested by the opponent. 4.13. If there is a possibility of capture on two or more directions of a king or men, a player has a choice capture, regardless of the number or quality of pieces (Kings, or men). 4.14. If a man is captured on the last (eighth from himself) horizontal line and have opportunity to further capture, it must continue the capture, but as king. 4.15. If a man reaches the last horizontal row without capture, it becomes a king, is stopping on the last row and can to capture at the next move only. 4.16. The difference in the rules of capture in the Brazilian version of draughts-64. 4.16.1. Capture of the greatest number of pieces is required. If you have a choice of kings or men, then you can to capture any of them, respecting the rule of the capture the largest number of pieces, regardless of their quality. 4.16.2. If a man reaches the last (eighth from himself) horizontal line when it is captured pieces and it have the opportunity to continue capture pieces, it is obliged to continue capture the same course, and remain man at the same time. 4.16.3. If a man reaches the last (eighth from himself) horizontal line and has the opportunity to continue capture the pieces, as a king, then it becomes a king, stopping on the last row, and can to capture at the next move only, if it is still possible. 5.1. If during a game revealed that board is wrong regarding article 2.1.4., the game is annulled and replayed. 5.2. Compliance with article 2.2.2 has to be checked before the start of the game. For each irregularity noted during the game, article 5.4. below holds. 5.3. If a player will moved randomly one or more of his pieces or opponent pieces on the board in the game he must restore the correct position on own time. A referee may punish a player who moved pieces. 5.4.14. Taking, after a capture, one or more of one’s own pieces. 5.5. Situations have arisen on the board for reasons beyond the control of the players are not considered irregularity. 5.7. If a player makes a move after his opponent has committed an irregularity or has refused to comply with the Official Game Rules, his move indicates an acceptance of the situation. Then a rectification can no longer be obtained. 5.9. The referee has the right to punish the player who committed the irregularity. — A draw when neither of the players has been able to win. 6.1.4. refuses to comply with the rules. 6.2.3. neither player can win. 7.2.1. If one player proposes a draw and his opponent accepts the offer. 7.2.2. If any of the opponents cannot win. 7.2.3. If three (or more) times the same position is repeated, and each time the same player having to move. 7.2.4. If a player has in the party three kings (and more) against a single enemy king and his 15th move (counting from the time of establishing the correlation of forces) cannot capture enemy king. 7.2.5. If within 15 moves the players made ​​moves only kings without moving of men and not making the capture. — In 6, and 7-pieces endings — 60 moves. 7.2.7. If a player having in the party three kings, two kings and one man, one king and two men against one enemy king, located on the long diagonal, his 5th move will not be able to achieve a winning position. 7.2.8. If a player having in the party two kings, one king and man, one king against enemy king to their 5th move will not be able to achieve a winning position. 7.2.9. In the case of time control before the end of the party without the addition of «Fisher» seconds per move positions: three kings, two kings plus man or a king and two men, against one enemy king, located on the long diagonal; two kings, one king and a man, or one king against one enemy king, do not play, just recorded a draw, excluding case when the game is obvious and the player can continue to demonstrate the victory. 7.2.10. End of the game, as described in Articles 7.2.7., 7.2.8, 7.2.9. is called a regulation draw. 8.1. Notation is a system of symbols of board fields. 8.2. Eight boards horizontal rows denote by numbers from 1 to 8, eight vertical columns — small Latin letters from «a» through «h» (a, b, c, d, e, f, g, h). The letter «a» is denoted by the leftmost vertical column from player which plays white (the rightmost vertical line from player which plays black). The first horizontal row is the line closest to player which plays white. 8.3. Each field by the board denote depending on which vertical and horizontal it is located, ie each field is denoted by a combination of letters and numbers showing the vertical and horizontal rows, which are located at the intersection of the field. 8.4. Notation makes possible to record a whole party and some positions. For example, the location of pieces at the beginning of the party (Diagram 3) can be written as follows: white — a1, a3, b2, c1, c3, d2, e1, e3, f2, g1, g3, h2 (12) black — a7, b6, b8, c7, d6, d8, e7, f6, f8, g7, h6, h8 (12). 8.5.3. The two names may be separated by a colon ( : ) in case of a capture. 8.5.4. If the capture a few pieces in one move is need, the record of capture is as follows: first write the field from which the capture is beginning, and then a colon and the designated field, for which man (king) got after the capture. 8.5.5. If it is necessary to note the direction of the capture, after the field that started the capture, consistently record the designation of the fields on which the change in direction was done with a colon between the designations of the fields. In these positions should be done a complete record in the form, as indicated above. 10.1. It may be arranged for a game that each player has to play a certain number of moves in a given time. 10.3. It may be arranged for a game that each player has a certain time till the end of the game. In that case, it is obligatory to use a playing clock without the obligation to record the moves. 10.4. The description and the rules of use for the clock are treated in the Rules for Competitions. A game is considered accelerated when the time that is allowed for each player for the whole game is not more than 30 minutes. There are two categories of accelerated games. A. The rapid game, where each player is allowed a time between 10 and 30 minutes inclusive for the whole party, or when electronic clocks and the Fischer system are used between 10 and 15 minutes with additional seconds per each move. B. The blitz game, where each player is allowed a time between 3 and 5 minutes inclusive for the whole party, or when electronic clocks and the Fischer system are used between 3 and 5 minutes with additional seconds per each move. Apart from the exceptions given below in this Rules, the normal regulations hold. If tie breaking involves playing decisive games, these must be at the same rate of play or faster than those of the competition. Recording games is optional, but the use of clocks is obligatory. For official FMJD tournaments the use of electronic clocks and the Fischer system is obligatory. When the players do not record the games the 20 moves rule is not valid. The players may agree upon a draw only if the number of men for each player is 6 or less. Any player who wishes to claim a regulatory draw (see Rules of the game, item 7) may do so. The referee will decide if the claim is correct and if so he will end the game. The following articles are only valid when not using electronic clocks with the Fischer System, but only using a given time for the whole game. During rapid or blitz games, if only three kings remain, two king plus a man, or one king and two men, against one king on long diagonal, or only two kings remain, one king and a man, or one king against one king the game shall be considered a draw, excluding case when the game is obvious and the player can continue to demonstrate the victory. This end of the game is not played and is called a regulation draw. If both flags have been fallen the game is considered a draw.